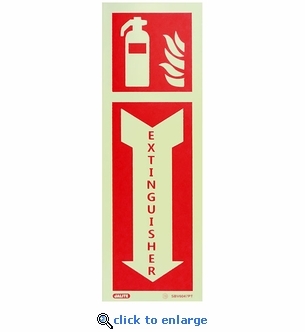 These high-brightness 4" x 12" photoluminescent fire extinguisher arrow signs on adhesive vinyl are energized by ambient light and will illuminate the instant lights go out. Glow in the dark location signs will ensure your fire extinguishers are easy to locate in the event of a power loss or fire emergency. The photoluminescent material is charged by common light sources such as daylight, tungsten filament and fluorescent lights. One hour of exposure to ambient light source will sufficiently charge the photoluminescent sign to glow brightly for more than 8 hours. Jalite high-perfromance photoluminescent materials are non-radioactive and non-toxic. 9 or more qualify for Free Shipping.